Criminal violence in El Salvador and Honduras is on the rise, making hundreds of thousands flee. Within this context, lesbian, gay, bisexual, transgender, and intersex persons (LGBTI), in particular transgender women, are a small but highly visible and vulnerable group. Transgender women face pervasive discrimination and violence in their countries of origin in great part due to a dominant patriarchal structure that does not allow them to safely express their gender identity. Thus, transgender women flee north to Mexico seeking international protection. However, even with refugee status, they continue to face overall a deeply hostile transphobic society in Mexico, which limits their possibilities of integration. The research question explored in this chapter is to what extent transgender women fleeing Honduras and El Salvador can openly live their gender identity in Mexico and whether this process of self-emancipation serves as a protection mechanism for them. 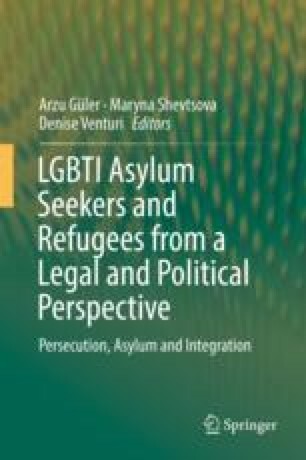 Through a desk review and individual case studies of transgender women from Honduras and El Salvador, this chapter argues that while extremely high risks follow transgender women through their journey and into their integration in Mexico, transgender refugee women find ways for self-emancipation through openly expressing their gender identity in LGBTI safe spaces. Nevertheless, though it is a key protection mechanism, these important efforts are not enough to overcome systematic and systemic challenges they face such as intersectional transphobia and xenophobia.